When the hard drives are formatted, or their partitions start to give problems, it's possible that we encounter the loss of important data. O&O FormatRecovery is an application created to fix these problems. Thanks to O&O Format Recovery you will be able to easily reestablish files and directories, including those that belong to any 64-bit Windows version. 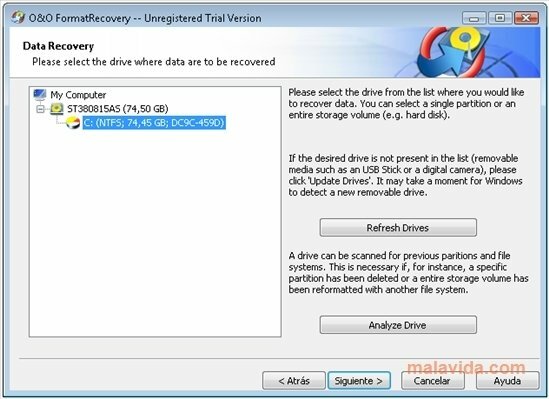 Likewise, it can reestablish formatted or deleted partitions and recover their contents, which very few programs can do. Furthermore, O&O FormatRecovery is even capable of finding files that were previously marked as hidden thanks to its incredible assistant that will guide the user at all moments. All in all, if you have lost data or have a corrupt partition, this software can become your salvation. The interface of O&O FormatRecovery is very clear and at all times it offers the user information so that he/she can know exactly what's going to happen with the data, the possible problems and the solutions. The trial version doesn't allow you to save the recovered data.